NOTE : Activation key must be used on a valid Steam account, requires internet connection. About the gameWe've always done a lot of add-on content for our games. We love making them and you always ask us for more. 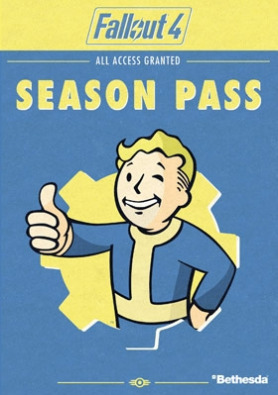 To reward our most loyal fans, this time we’ll be offering a Season Pass that will get you all of the Fallout 4 DLC we ever do for one great price.System Requirements Windows - Minimum… Windows 7/8/10 (64-bit OS required) Intel Core i5-2300 2.8 GHz/AMD Phenom II X4 945 3.0 GHz or equivalent 8 GB RAM 30 GB free HDD space NVIDIA GTX 550 Ti 2GB/AMD Radeon HD 7870 2GB or equivalent Windows - Recommended Windows 7/8/10 (64-bit OS required) Intel Core i7 4790 3.6 GHz/AMD FX-9590 4.7 GHz or equivalent 8 GB RAM 30 GB free HDD space NVIDIA GTX 780 3GB/AMD Radeon R9 290X 4GB or equivalent© 2015 Bethesda Softworks LLC, a ZeniMax Media company. Bethesda, Bethesda Softworks, Bethesda Game Studios, ZeniMax and related logos are registeredtrademarks or trademarks of ZeniMax Media Inc. in the U.S. and/or other countries. Fallout, Vault Boy, and related logos are registered trademarks or trademarks ofBethesda Softworks LLC in the U.S. and/or other countries. All other trademarks or trade names are the property of their respective owners. All Rights Reserved.